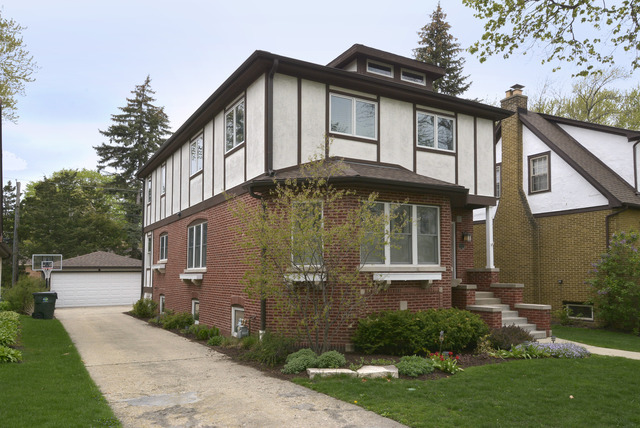 Expanded & updated renaissance home just blocks from downtown Arlington Heights. The perfect marriage of vintage charm & modern conveniences. Sun drenched living room with hardwood floors & plantation shutters opens to dining room. Dynamite kitchen with breakfast bar & eating area, rich wood cabinets & granite counters, SS appliances. Unique keeping room off of kitchen is a great den or office. 4 full baths with upgraded tile & fixtures. Basement bath plumbed for steam shower. Master suite & good sized bedrooms. Hardwood floors throughout. Finished basement with radiant heated floors. Lovely yard with paver brick patio & fire pit. 2 car detached garage. Built in surround sound speakers & wiring stay. All this & close to downtown business district & train.